Ecotones promises to use its brain to give you the best night of sleep you have had in a long time. Throw out the warm milk and even those therapeutic beds. The soothing sounds of the ocean or a lite rainstorm could be the cure to insomnia if one Bay Area company has played its cards right. A Campbell-based company is making waves (sorry for the bad pun) with its new table top device that hopes to empty your wallet for a good night's sleep. 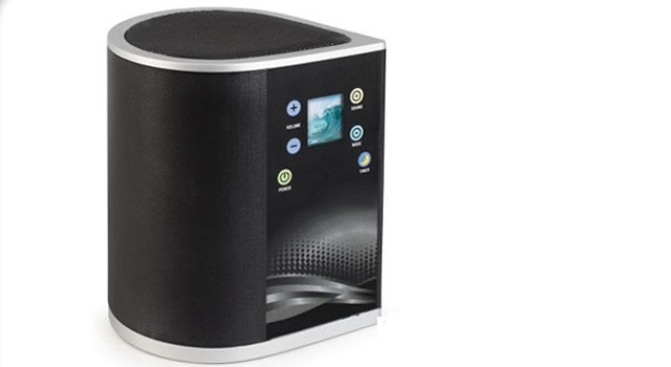 Adaptive Sound Technologies has developed a sound machine called called Ecotones claims it is smarter than your average sound machine. The new device, which sells for $299, promises to add additional soothing sounds if it detects a disturbance in the room. So imagine you are sleeping to a soft rainstorm in the Guatemalan rain forest when your neighbor's dog decides to bark nonstop at the moon, well Ecotones will hear the dog bark and add soft sounds to drown out the meddle mutt so you can continue to sleep. Pretty sweet. The machine has a wide library of sounds from "babbling brooks to cricket chirps to fireside crackling," CEO Sam Nicolino Jr., told our friends at the New York Times. “We trick the ear into thinking it is listening to something pleasant,” he told the Times. The machine uses a microphone to detect any noise that shouldn't be there and will respond accordingly to help ease your sleep. Sounds good.